The Houston Press presented their first BrewFest back in May and they're had so much fun with it that they decided to do it again. 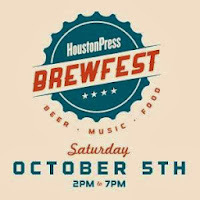 The next Houston Press BrewFest takes place on Saturday, October 5th from 2pm ~ 7pm at Silver Street Station (the same location as last time). About 30 breweries will be serving up about 110 different beers on tap and from the bottle. There are General Admission and VIP ticket options available and both include eight 3oz sample cards. The VIP ticket also grants you access to a special area with another dozen or so beers and appetizers. Further information about ticket options and prices is available online, but the prices do increase the day of the event. 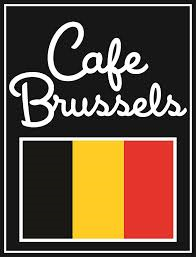 A complete list of the beers being served is also available on their website. There isn't too many beers on that list that will make the average beer geek swoon, but it is a great festival for people who are just getting into craft beer as they can try a variety of styles in one place. There will also be bands playing and local food trucks available. Don't worry about any rain that may be in the forecast, the venue is an old large warehouse, so you'll be doing your beer sampling indoors. Call (713) 222-6996 for reservations. The glasses are available starting at 6:00pm and only one glass per person with purchase of the beer of the day. As always, the glasses are subject to change and only available while supplies last. The continuing expansion of the craft beer industry in Texas was certainly evident at the 2013 Texas Craft Brewers Festival last weekend in Austin. There was 39 breweries slated to attend and though there was a few last minutes cancelations (5 Stones Brewing, Independent Ale Works, Brigadoon Brewery) due to "unforeseen circumstances", it was still a bigger list then any previous years. And since a lot of the new breweries don't have a very wide distribution, it was a great opportunity to try beers that may not make their way down to your area. The festival took place in Fiesta Park just East of downtown which has a large covered pavilion in the middle that provided shaded seating, stage for the band and later on in the afternoon, cover from the torrential downpour that moved through the area. As with most beer festivals, there was a VIP package ($70) and General Admission ($20) and there's always a spirited debate on various beer forums whether the VIP access is worth the extra cost. Typically included with a VIP package is access to the festival earlier then the general admission ticket holders and access to special release beers. Other potential perks sometimes include special bathrooms, food, t-shirts, glassware, etc. In this case, the VIP package included entrance to the festival two and half hours before general admission with full access to all beers being poured in the booths (with the exception of the scheduled releases) as well as a t-shirt and commemorative glass on exit. During the early access time, a lot of brewers were wandering around under the covered pavilion area and pouring from pitchers and talking with people. This was definitely the highlight of the VIP access as the beer they were pouring didn't require any tickets and you were able to talk directly with the brewers and other brewery representatives. Based on some early complaints I read, I think the value of the VIP access was what you made of it. I specifically moved around the pavilion, seeking out brewers I hadn't met before and beers I hadn't tried. I certainly haven't been to a festival that provided that level of direct interaction with brewers or festival access that much earlier then general admission. In fact, the majority of the beers I tried that day was during the VIP session. Overall, it seemed to be a well run festival and I don't really have too many complaints. I know there was a few people not happy with the policy of no kids allowed and I witnessed a group of people oddly refused entry with their pretzel necklaces ("NO food or snacks allowed!" proclaimed the rather over-zealous volunteer guarding the entrance). The sample glass was 4 ounces which I think is a little too large of a sample size. That's quite a bit to drink down before moving on to the next booth or very wasteful if you didn't finish and poured the remaining few ounces out on the ground. I like the option of one ticket for a 1 ounce sample and two or more tickets for a larger pour that I've seen at other festivals. Considering I saw a few kegs run dry before I left early, they may have lasted a little longer with smaller samples sizes. The lines were typically short and moved well, but since they had brewers hanging around the area in front off their booths to talk with the people, it was sometimes a little crowded and made it a little confusing about where the line actually was. A lot of complaints with VIP packages often comes down to the cost and perceived value (I've even seen people calculate out the cost per ounce of beer they consumed at the festival, then compare it to buying beer in the store or bar). For me, attending a festival is not about how much beer I can drink for the least amount of money, its about the overall experience. I sampled quite a few beers I hadn't tried before (and wouldn't typically get the opportunity to), met new brewers, reconnected with old friends, mingled with other festival goers and then managed to grab a cab just as the rain began. I was granted a media pass which included VIP access, but based on the great experience that I had, I would not have regretted my decision had I purchased the VIP package.